I don’t know about you, but if given the choice of shopping for lightweight travel strollers or diving to find a needle in a haystack, I would pick the latter. Even if the haystack itself were made from needles. Anyway, I haven’t found anyone who loves this task so i thought I’d share the experience of being a full time travelling family with a toddler, and create a guide to the best travel stroller for every kind of traveller. We have travelled extensively with our kids since they were newborns and we’ve made every travel mistake in the book, plus a few more. Don’t be like us. Read the guide to the best lightweight travel strollers. 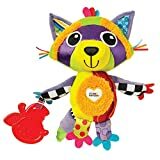 You’ll also want to check out our very popular guide on the 10 best mess-free travel toys for young kids here. This Red Kite travel buggy is very similar to the one we had when Esmae was a baby, except that we had it in a hideous pink pattern. 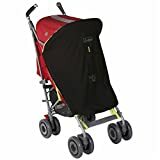 The Red Kite ‘Push Me 2 U’ stroller is suitable from 6 months (although I would say more like 9-10 months as tiny tots have a tendency to slide down / flop about) and has a deep padded seat so it can be easily used for older kids too. 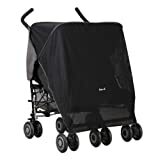 There are two positions, reclining and upright, and the buggy comes with a raincover and shopping basket included as well as the integrated canopy. It weighs just over 5kg so it is a great option for a lightweight travel stroller. If you’re looking to do a one or two trips abroad each year and on a fairly tight budget I would go for this one. The Mamas and Papas Cruise buggy is the perfect travel buggy for two babies or a baby and young toddler. This travel buggy has front suspension for a smooth ride and each back rest and leg rest is individually adjustable so each child can have their own preference. Each seat has a UPF 50+ fabric canopy with a pop-out sunshade, perfect for warm-weather holidays! 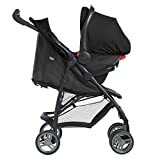 One of the best features of this 13kg buggy (this wouldn’t count as a lightweight travel stroller, but it is a double) is that it is slim enough to fit through standard door frames so is also ideal for solo-adult outings. A shopping basket and cupholder are also included. Maximum weight is 33lb per child. The Ickle Bubba Aurora Stroller is an incredibly sleek and compact lightweight travel stroller, weighing just 5.5kg. There are lay-flat and multi recline positions, making it a great option for travellers with newborns to older toddlers. The best thing about this travel stroller, apart from its contemporary design, is the one-handed folding action- ideal for adults having to hold a toddler with one hand and fold a travel stroller with the other! 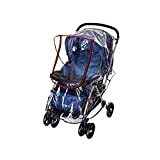 A raincover, carry bag and carry strap are included, making this a great value option for a lightweight travel stroller. 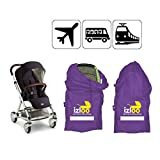 A sturdier compact travel buggy for the bumps and cobbles of the city, the Baby Jogger City Tour folds down small enough to pop in the overhead compartment of aeroplanes. The best travel stroller for cities has a UPF 50+ canopy and comes with a neat backpack to pack it away after use. The wheels swivel for city pavements and are also lockable for longer, smoother strolls. The Graco LiteRider travel system offers incredible value for money, with a travel stroller and car seat as a complete package at a lower price than most car seats. 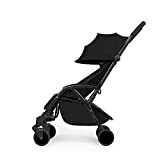 The LiteRider lives up to its name at just over 11kg and the car seat easily connect to the stroller for a complete travel system for newborns to toddlers. The stroller has a one-hand fold mechanism, perfect for parents juggling a travelling baby and changing bag too! This travel stroller is available in two colourways. 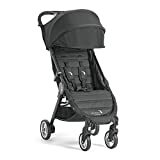 If you have a hankering for luxury travel, the Mamas and Papas Flip XT2 pushchair is the best travel stroller for you. Compatible with both car seats and carrycots and with forward or parent-facing seat options, the Flip is a lightweight travel system with premium safety and comfort features. Attach travel toys to the bumper bar for journeys with baby, peek through the magnetic window to check on your little one and ensure the sun doesn’t get in their eyes with the larger engineered canopy. The frame folds flat and is the travel stroller is available in contemporary and fashionable colourways. Umm, don’t take a travel stroller if you are backpacking in Bali or hiking mountains. Seriously, we can count the number of times we have used ours in the last six months during our family gap year in Asia on one hand. Instead we highly recommend a baby carrier; we’ve found that travel has made our toddler very active, physical and independent but there have been times when she’s needed a little extra help. 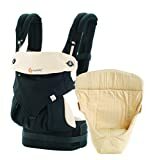 We love the Ergobaby 360 carrier; we got it when Elfie was born and love the newborn insert that you remove as they grow. It can be worn on the front or back with the child forward or reverse facing, and is super comfy to wear. The hip straps take the strain off your shoulders which is essential if you are often lugging a backpack around too! We have seen loads of families with this carrier as we travel and everyone we have met loves it! 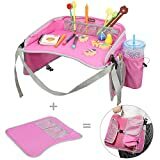 First things first- to prevent your travel stroller getting scraped, dented or otherwise damaged I would definitely recommend this protective bag. When we’re not packing our stroller onto the plane we use it as a ‘wet bag’ for beach stuff as it is fully waterproof, so it comes in hand several times over! We’ve found it handy (and economical) to buy a ‘Universal’ raincover for our travel strollers, rather than branded ones. This one has a zip front opening and fits hundreds of stroller models. 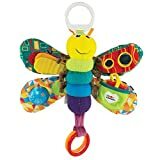 Lamaze buggy toys- we love these bright and colourful multi-play toys that come with sturdy plastic rings to attach to any stroller or travel system. Also great for teething! Is anyone else jealous? Do these come in adult sizes? Offers kids their own area to draw and play and folds up compactly for flights. Amazing. could probably have used a stroller bag to protect ours. we only ever travelled with basic or old umbrella strollers and twice have had them totally destroyed by the airlines or lost. their replacements have been new ones and we’ve just dumped the old! youngest is now nearly 5 years old and really not sure why i still keep the stroller in the car as he’s too tall for it anyway!